The acquisition follows the announcement in December of the proposed merger with Shepshed Building Society in July 2013 and will further extend the reach of The Nottingham’s franchise and high street network. The acquisition will strengthen the Society’s existing estate agency offering and provide the opportunity to make its range of mortgage, savings, planning & protection products and services available on more high streets across the East Midlands and beyond. There will be significant benefits to the enlarged Society, as each party makes its own expertise and skills available to members and new customers. Harrison Murray is a leading estate agent in its local markets and The Nottingham is an award winning regional building society. 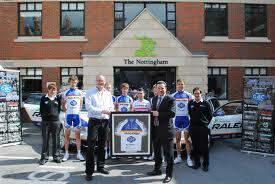 Harrison Murray will continue to trade under its existing name as part of The Nottingham family. The acquisition makes The Nottingham the largest independent estate agency in the East Midlands, with 32 estate agency branches across its trading area. David Marlow, Chief Executive of The Nottingham, said, “Following a period of strong performance by the society in difficult market conditions, this acquisition is part of our strategy to grow both our profile and reach. This is good news for local customers and staff of both organisations, as we combine our complementary capabilities and locations to improve the range of great value products and services on offer through an enlarged network. Nick Salmon, Managing Director of Harrison Murray Ltd, added, “We are extremely excited to become part of The Nottingham family. Like The Nottingham, we have performed well in a tough market and we believe this move strengthens our position further. There are strong synergies from becoming part of a larger group with complementary skills, which undoubtedly will bring new opportunities and stronger choice for customers.